It’s difficult to truly capture the complexity of feelings among the Apostles following Jesus’ Ascension! However, among them, there would have been a great sense of loss, anxiety and anticipation, as well as, fear of the unknown. The Apostles response was no surprise, just as we would do given the same grave challenges, they resorted to praying. At some point during the following days, before the descent of the Holy Spirit, a crowd of around one hundred and twenty had gathered. They included the Apostles and women, and probably, the seventy and others from the gathering of five hundred whom Jesus appeared to. Simon Peter stood up among them and said, “Brethren Scripture had to be fulfilled… concerning Judas,” and now it is necessary for us to appoint his replacement, someone from among us who was a true witness to Jesus’ ministry, from his baptism by John to his resurrection. 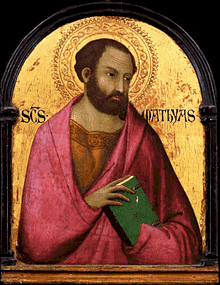 Two names were put forward, Joseph called Barsabbas and Matthias. They then prayed, “You, Lord, who know the hearts of all men, show which one of these two You have chosen to occupy this ministry and apostleship from which Judas turned aside to go to his own place”. (Acts 1:24-25) Then they drew lots and, through the working of the Holy Spirit, Matthias was appointed. The Apostles prayed together for guidance in their work from the Holy Spirit, is that my first daily thought? Risen Lord Jesus, help me in my decision-making. May everything that I do be inspired by your Holy Spirit. Amen. and journeying side by side with you, Lord Jesus. and the repose in our Father’s home! for eternal is your love. Today in 1941, around 10,000 Jews were shot by German Soldiers at Ninth Fort, Kovno Getto during the Holocaust. It’s known as the Great Action!